He also got a $3 million salary and shares worth $121 million from his 10-year stock award, bringing his total haul to $136 million, along with perks of about $682,000. Cook received a $12 million bonus for the year ended Sept. 29, the Cupertino, California-based company said Tuesday in a filing. 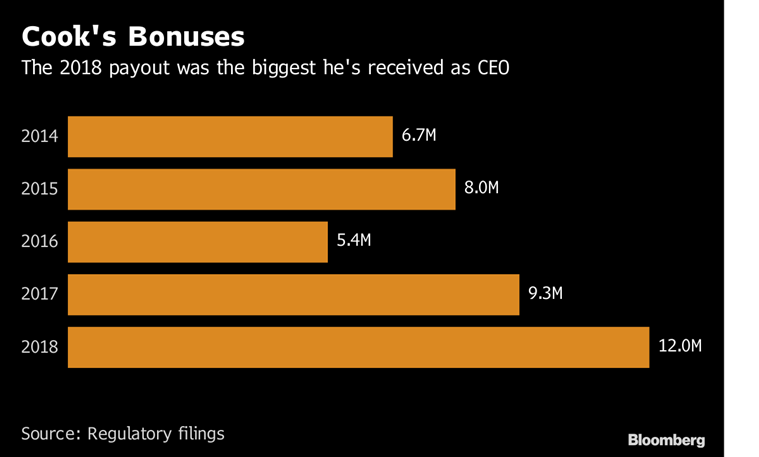 He also got a $3 million salary and shares worth $121 million from his 10-year stock award, bringing his total haul to $136 million, along with perks of about $682,000. The bonus was linked to revenue and operating income targets, both of which rose 16 per cent from a year earlier. Tim Cook’s bonuses since 2014. Repeating that feat may be challenging. Last week, Apple disclosed lower-than-anticipated demand for iPhones in China and elsewhere and cut its revenue forecast for the first time in almost two decades. The announcement punished the stock, which has tumbled 12 per cent since then. The bulk of Cook’s pay comes from the big stock award he received in 2011 when he succeeded Steve Jobs as CEO. It pays out in annual increments. The number of shares he receives partially depends on the performance of Apple’s stock compared with other S&P 500 companies. In August, Cook collected 560,000 shares because Apple outperformed more than two-thirds of the firms over three years.